Rocky Mountain ATV Jamboree is held in September annually in Richfield, Utah. More details about the jamboree are found in this video with Kirk and Kevin. As this winter dishes out more and more snow, it may be time to consider a more efficient way to plow snow. Do you own an ATV? Why not put it to work by converting it into a snowplow? Your ATV is strong enough to plow through the toughest blizzards, but is compact enough to be stored in your garage. This could be the perfect answer to saving time and money (and your back) during these brutal winter storms. 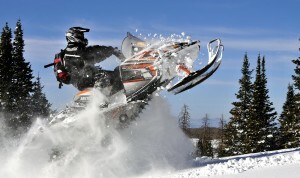 Before you install a plow blade, make sure your ATV tires are built to handle a snowy season. Having a plow won’t do you much good if your tires are spinning. A few of our favorites are: Carlisle Snow Hog Holeshot, GBC Mud Shark C921 Mud/Snow, and Duro DI-2018 Sand / Snow ATV tires. When you are shopping for an ATV plow blade, be mindful of the specific make and model of your ATV. Not all blades will fit your particular machine. Make sure that the blade has an efficient curve to be able to scoop out copious amounts of snow. The following isn’t a detailed installation guide, however it will give you a good idea of how much work would be involved in installing your own blade, so you can tell if it is within your capability. It is easiest to raise the ATV with a lift before trying to mount a plow blade so that you can see the underside of your machine. To install your plow mounting kit, you will need a ratchet, a few wrenches and possibly an electric drill. All the hardware you need should be included in the kit. Make sure to read the instructions thoroughly before beginning. Your first step will be to attach the base plate to the underside frame of your ATV, using a socket and ratchet to loosely secure the screws (you’ll tighten them in a minute). The plow mount plate goes on next and fits into the base plate. Once you have this in place you can tighten the screws. From here you will bolt the blade to the push tubes and attach the blade springs; then secure the pins of the push tubes to the swing latches on your mount plate. For plowing, your blade will need to be in a vertical tilted position – this is one of the four positions the blade stops allow for. After installed, you will need to adjust the springs a bit so you can attach the winch wire to the push tubes. Installation of the blade skids comes next – these are attached with nuts and washers and need to be aligned so they touch the ground at the same level as the wear bar. You will then adjust the swivel position of the blade and lock it in place with the pin in the top of the push tube. All that’s left now is to run the plow motor wires to the ATV battery. You will mount the ATV plow control panel and its motor to the side of the handlebars using C-Clamp mounts. On paper it sounds more complicated than it is. The instruction manual that comes with your kit should make it all crystal clear. So, throw away your shovel and get yourself behind the wheel of your own snowplow. You just may find yourself wishing it would snow more! Crying Because It Is Too Cold To Enjoy Your ATV? Are you feeling cooped up and bored with the winter cold? Here in Utah we have had an extra cold winter and we are not the only ones. The whole USA has had plenty of cold. Last week our nights were well below zero degrees Fahrenheit and the days struggled to reach 15 degrees. If you are anxious to get outdoors for some recreation and speed, you may consider renting a couple of snowmobiles for the weekend. We have been out snowmobiling several times this year and have found the temperatures to be lovely in the mountains. Sometimes an inversion sets in the valleys making towns in the valleys very cold. The mountains may be 20 degrees warmer. That was the case yesterday. It was 10 degrees Fahrenheit in the valleys and 25 degrees in the central Utah mountains. It made for a fabulous day and photographer Kreig Rasmussen was able to get some fantastic snowmobiling in powder images to prove it. 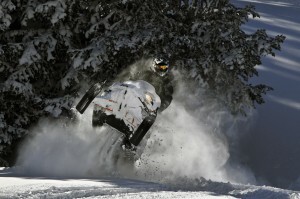 So while your itching to ride your ATV or UTV just get in and go try a snowmobile ride. You will find it totally addicting. 3) Select a widget and drag it into the "Default Sidebar" area. The Contact, Find Us and Blog page have their own sidebar areas. Duplicate your "Default" widget(s) or add different widgets.